INTRODUCTION: The stromal Tumors are rare neoplasms of the gastrointestinal tract. It has an incidence of 4 per million people. They are derived from cells of Cajal located in the myenteric plexus and are related to intestinal motility. This type of neoplasm present with bleeding from obscure, unexplained anemia. Studies ordered for this type of pathology double balloon enteroscopy, videocapsula, endoscopy and colonoscopy to determine the site of bleeding. 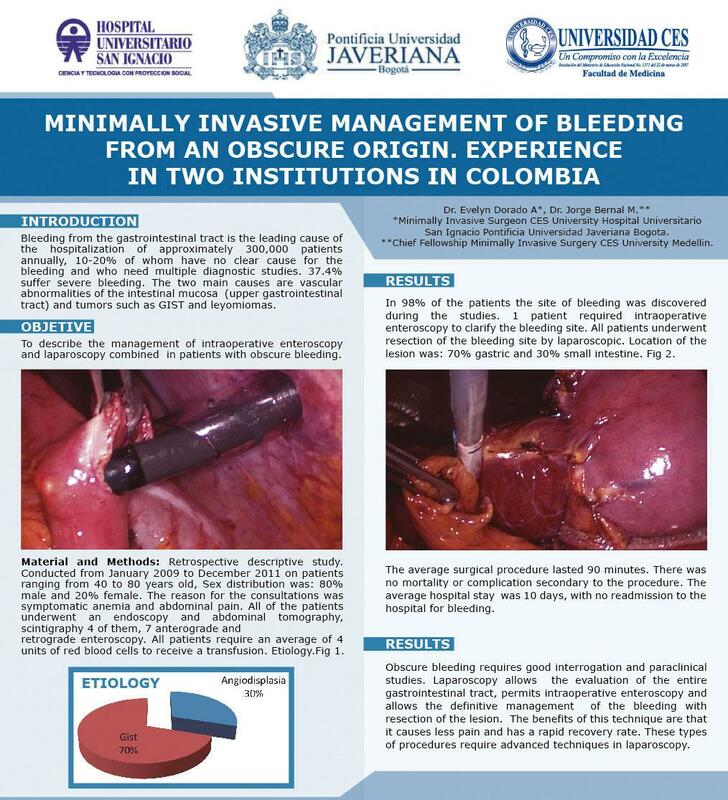 Main: Describe the minimally invasive management of patients with GIST of the small intestine studied as obscure bleeding . Methods: Retrospective descriptive. A sample of 3 patients over a period of one year July 2010 – July 2011 with a history of anemia, blood transfusions for bleeding from obscure origen. In two cases detected by enterescopia, 1 case with enteroscopy assisted by laparoscopy but the mass was seen in the laparoscopy. RESULTS: All three patients are carried by laparoscopy two with evidence of the injury site by the enteroscopy and videocapsula, and another with laparoscopic visualization of the mass. patient deserves a enteroscopy laparoscopically assisted . In all three cases were mass-dependent vascular proximal jejunum (3 cm ligament of Treitz) and distal jejunum in communication with the lumen of the gut and stigma of bleeding. Bowel resection was performed and stapled ,anastomosis laterolateral, and closed handsaw , operative time 200 minutes, 100 cc bleeding, a patient being left with drain for teh anastomosis 3 cm from Treitz, oral intake at 48 hours, 4 days hospitalization, no complications from the procedure. Pathology report: Stromal tumors of low grade, less than 4 cm, with low mitosis. The realization of laparoscopically assisted enteroscopy is easy to perform a comprehensive assessment helps when there is doubt the site of bleeding.